Hot off the Mill is UPR's latest addition to the line of Truck & SUV Bling this Billet 4x4 Selector Knob. Available in Red, Blue or Green illumination to match your trucks interior lighting. Designed to replace the factor knob in the same style as our Slimline AC and headlight knobs. 1999 2000 2001 2002 2003 2004 Superduty F250 F-250 F350 F-350 F450 F-450 Vehicles. 1995 1996 1997 1998 1999 2000 2001 2002 2003 Ranger Vehicles. 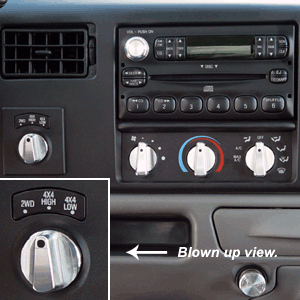 If your stock 4X4 knob size is 1.275" diameter with a .250" long mounting shaft on the back this is the 4X4 knob for you. No one else can stack up to the bold clean styling of our aftermarket Billet dress ups, Street Strip & Racing Suspension & Performance Parts for your late model American Muscle Car or Truck!